Who are your top performers on track to break a sales record? And will your team members hit their monthly targets? Are deals getting stuck in a particular pipeline stage? Do you need to course correct on your sales process? Our new sales reporting reveals it all. We’re introducing two new sales reports to give sales managers greater visibility into the health of their sales teams. Task Metrics Report and the Sales Performance Report give you better visibility into how your sales team is performing. Track the output of your team and understand where deals are sitting in your pipelines. This leaderboard-style report allows you to see how top performers are set apart from the rest of the team. You can use it to ensure that your team is hitting their sales targets. In addition to top-level metrics like average deal value, the Sales Performance Report also makes it easy for you to visualize the deal value and number of deals per sales rep. The report is a great tool to see a quick glance of the current health of a sales team, and also helps you review historical information. Want to see how the team did last month? Or what deals were won or lost last quarter? By filtering the report by dates and deal status, you can focus in on what’s working and where there’s room for improvement across your team. 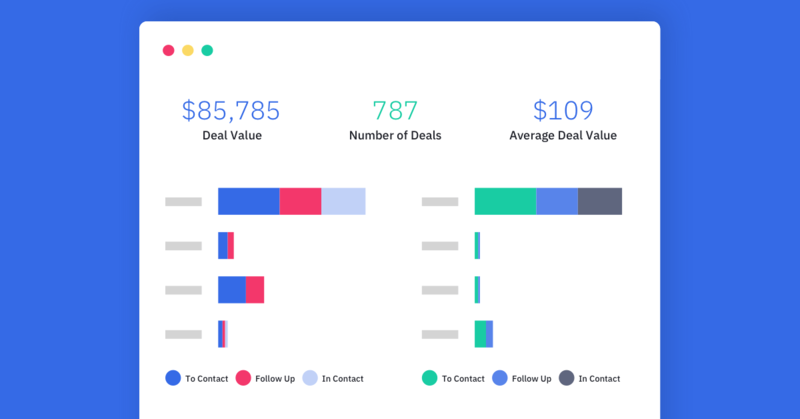 The graph breaks down the total deal value and total number of deals by stage – providing insight on where deals are sitting in the sales process. This gives sales managers a sense of where they might need to offer guidance and coaching if deals are continually getting stuck in a particular stage. You can customize the report to hone in on different aspects of your sales process based on what matters most to your business. Capture insights on what types of deals you’re winning and losing. Get real-time visibility into which deals your reps are close to closing this month, or look back on the quarter to understand where you need to change course. Additionally, you can filter by pipeline when you’re managing sales performance across several territories or services lines. Tasks are the lifeblood of your sales process. They act as a “to-do” list for your sales reps to get a deal to the next stage. A deal with no tasks means money left on the table. With the Task Metrics Report, you’ll never let another deal fall through the cracks. The Task Metrics Report gives sales managers visibility into the team’s output so they can give guidance where necessary. You don’t have to wait until the end of a sales cycle to course correct. You can see all the activity that’s happening by salesperson. Filter the report by pipeline, task owner, and task created date to customize your view. Now all the important details about your sales team performance are inside ActiveCampaign and connected to the data that’s collected in your CRM, so you can jump in any time to see how you’re progressing toward your goals. Don’t wait until the end of the month or quarter to see how your team is performing. Get the insights and visuals today to compare individual team member performance, identify opportunities for improvement, and keep iterating on your sales process to grow your business. To start using these reports, navigate to the Reports tab in the menu and select Deals Reports.